We be looking for treasure, and ye best be booking soon if ye want to be a pirate! We be closing on October 1st for the 2018 season. As of September 4th, operating weekends only, except for large groups or private events. Please call to confirm or make reservation! Even with our 5-Star rating on TripAdvisor and Facebook, we still have room for more pirates. Please call to confirm departures, as space is limited. Reserve today if you dare!! We encourage you to arrive 30 minutes before sailing, allowing time to register and to transform your crew into pirates. 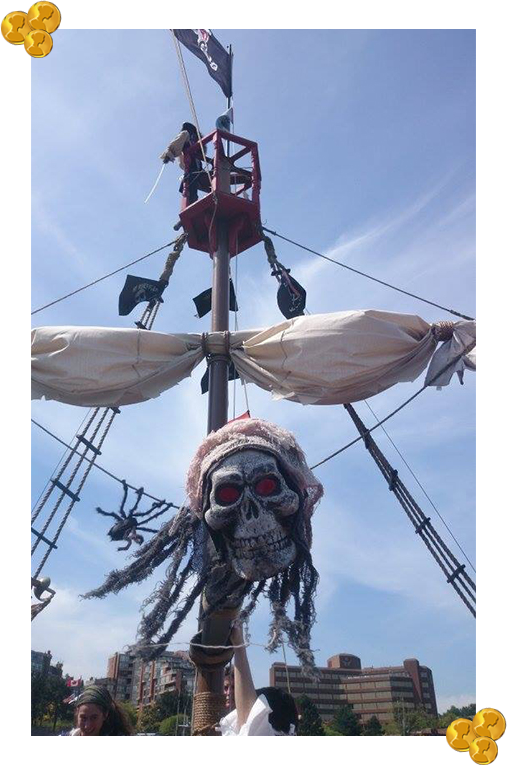 Upon arrival, the transformation begins as the crew gets to work preparing the new mates with pirate costumes and face painting. Leading up to departure, there will be light entertainment until the boat is fully prepared. * Our New Special, "Sunset with a Piratey Twist". Note: Sunset departures may vary, please call to confirm. To confirm your reservation a credit card number is required. We accept Visa, Master Card and Interact. You may cancel your reservation at no charge up to 72 hours in advance of your sailing time, for parties or groups greater than 15 guests 7 days notice is required for changes or refund. If you do not cancel or make the changes to your reservation as stated above or do not arrive for your allotted departure, your reservation will be non-refundable. Pirate Adventures reserves the right to cancel a sail if less than 16 passengers are confirmed. Children under four must be accompanied by a caregiver. Reservations will be held until 10 minutes prior to each departure. If you or any members of your party have not arrived by this time, we reserve the right to sell your tickets. When making your reservation, please be prepared to provide an accurate count of your party. Please remember that everybody on the boat counts toward our capacity. If you are reserving for a large party, please hold the maximum amount of tickets you think you will need. You may decrease your numbers up to 72 hours before your trip, but we may not be able to accommodate an increase. The captain reserves the right to postpone or cancel sails due to unforeseen circumstances without notice as safety dictates (if he judges the conditions to be unsafe for sailing). We reserve the right to cancel a sail in the event of steady rain, thunderstorms, high winds, or conditions deemed unsafe by the captain. In the unfortunate event that we must cancel a voyage we will call one hour before check-in to notify you of the cancellation. If we cancel your trip for any reason, you will not be charged. 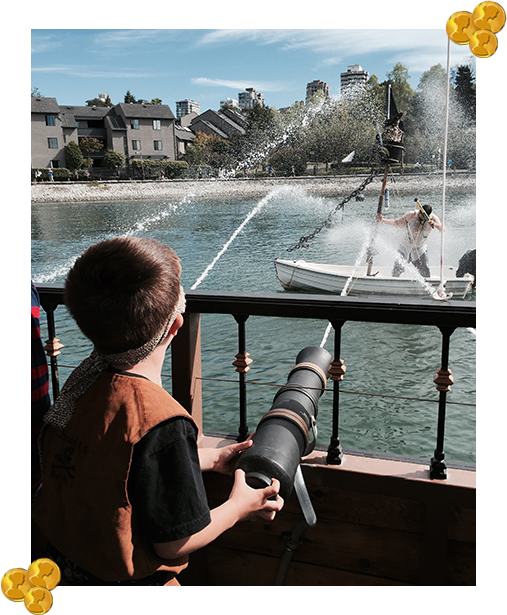 Cancellations due to weather are at the sole discretion of Pirate Adventures Canada.